On Monday evening, as millions of people across North America were getting ready to watch one of the year's biggest Monday Night Football games, Eva Shockey had other things on her mind. Like a certain big whitetail buck in Saskatchewan that she was playing cat-and-mouse with all this past week. Shockey had set her heart on this huge record book Canadian deer after seeing the massive 5X5 buck – with at least one kicker point – in some trail camera photos taken earlier in her hunt. She had even seen the deer up close and personal from her stand on one evening hunt. But unfortunately, the deer didn't come into archery range until legal shooting light had faded from view. Monday evening, with an unfilled deer tag burning a hole in her back pocket and a change to colder weather and snow stirring up the local deer woods, Shockey dutifully went back to work. The work of sitting in a chilly deer stand as a cameraman looked on, filming Shockey's deer hunt for the ninth day in a row. As the Outdoor Channel television personality sat quietly in her stand, Shockey hoped that her hunting luck would finally change. And a few moments later, it did ... in a big antlered way. "BOOM! Biggest buck of my life and got him with my BOW!," tweeted Shockey to the world after her successful Monday afternoon hunt. "I am on cloud a million!" A short while later, after recovering the massive buck, Shockey sent out a Facebook message and a photo of her big whitetail to the thousands of fans who follow her on social media. "I am SO excited still about my buck tonight," Shockey posted. "My heart is still pounding. We hunted hard for nine days straight for this deer and it finally all came together." Shockey, only the second female to ever grace the cover of Field & Stream magazine, said that she felt a lot of pressure when the deer came in to her area. "I don't think I've ever felt so much pressure to make a good shot and it (somehow) ended up being the best bow shot I've ever made," she said on Facebook. "My first time hunting with my BowTech Carbon Rose (bow), (my) first time hunting with Muzzy broadheads and my first time hunting whitetails in Saskatchewan without my dad. I am so grateful for this beautiful buck." Shockey's dad Jim, the well-known Outdoor Channel personality and TV show host who heads up the new smash hit Jim Shockey's UNCHARTED, is currently away from North America while hunting and filming. "(I) can't wait to tell my dad about it when he calls me from Africa," said Eva. 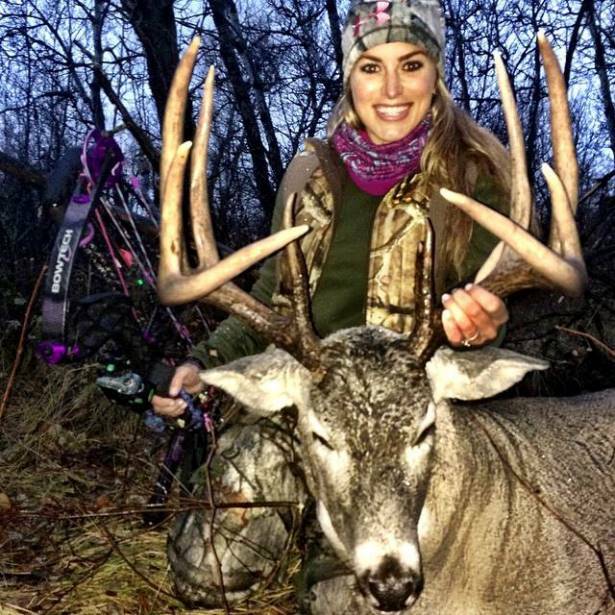 A short while later, Eva Shockey took to her Facebook page yet again to give more information on her record-book buck to scores of hunting fans while also answering a few critics. "For those wondering/assuming things about my whitetail hunt, I'll clarify a few things," she posted. "Number One, it's not high fence (place). It's on my parents' farm in Saskatchewan. Totally free range. "Number Two, we (will) eat every bit of meat from this deer. I grew-up eating venison – it's my favorite type of wild game. Trust me, it won't be wasted. "Number Three, this deer was not 'put in front of me.' We spent weeks preparing for this one moment. (Cameramen and show producers) Wojo, Taylor, Dean and I set up stands, put out trail cameras and did everything in between to make this hunt come together. "Number Four, we hunted straight for nine days, morning and evening, changing stands depending on (the) wind direction. (We were) up at 4 am every day. "(And) Number Five, the deer in Saskatchewan have had two tough winters in a row and the coyotes have taken many deer on top of that, but we were hunting the oldest bucks of the bunch that were likely already finished breeding and going downhill. It took me nine days to get this buck because I wasn't going to shoot any young buck that walked in. "Hopefully that helps you understand the hunt a bit better. It's always easier to judge and assume than to be happy for someone. We are all hunters, so let's stick together and unite as one group. We have enough enemies out there that hate what we do – don't give them more fuel!" By evening's end, Shockey was all smiles after arrowing the biggest buck of her hunting career, a hunt that finally came together on camera after nine days of hard hunting in the Canadian outback. It all culminated when she smoked a massive, wild Saskatchewan whitetail at archery close range with her BowTech bow. It’s a monster October buck that is destined for the record book, the Shockey dinner table and an Outdoor Channel television show. And when all of that comes true, who needs to watch a Monday Night Football game?